Busy night? 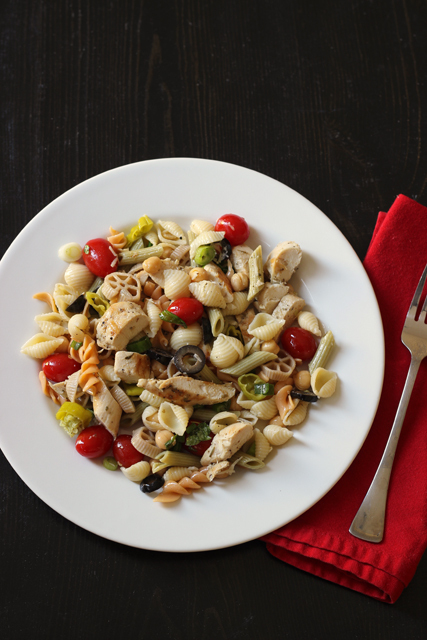 Grab a bowl of this make-ahead Italian Chicken Pasta Salad. It’s easy to make and packed with flavor. The season is telling me it’s time to make salads. Well, that’s not really true. I like salads all year-round. I guess what I mean is that it seems the time to make things like potato salad and bean salad and macaroni salad. These kind of salads can be made in advance, packed in school lunches and for picnics, and pretty much make everyone at the table happy. Am I right? I particularly love the salads that I can fill with all kinds of tasty veggies, beans, and protein. All those yummy bits mixed together. I can make a big batch and that, my friends, can be dinner. 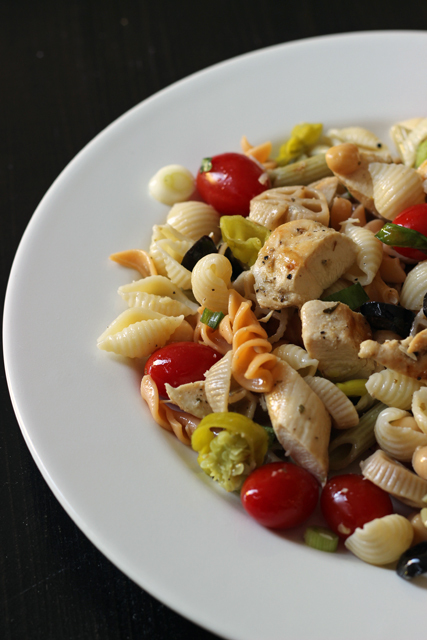 This Italian Chicken Pasta Salad is exactly that. 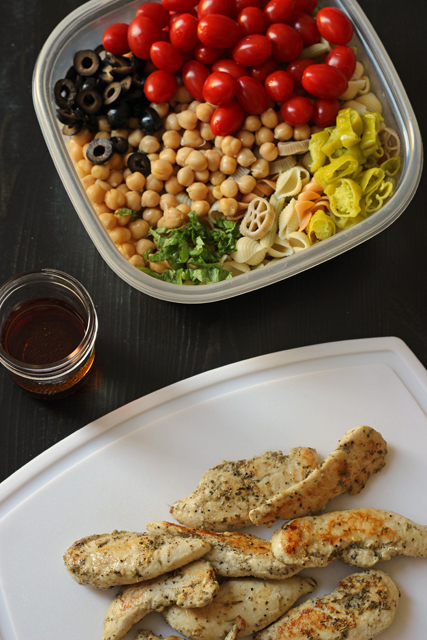 I took some of my favorite Italian salad toppings and grilled chicken and vegetable pasta. Super good! You can easily double this and customize the mix-ins. I love to buy the frozen chicken tenders from Trader Joe’s. They are ice-glazed and packed in a zip-top bag so you can pull out just as many as you want. The flavor and texture is absolutely perfect. The chicken never dries out; it’s just always delicious. You can skip the chicken, use more, or use less, depending on how much you want to spend on the dish. It’s very forgiving and super simple. In a pot of salted, boiling water, cook the pasta according to package instructions. Drain, rinse and set aside. In a large skillet, heat 1 tablespoon oil until shimmering. Add the chicken pieces and season with garlic powder, Italian herbs and salt and pepper to taste. Cook until the chicken is cooked through and juices run clear, about ten minutes. Remove to a cutting board and cool slightly. Chop roughly. In a large salad bowl, combine the pasta, chicken, beans, tomatoes, pepperoncinis, olives, onions, and basil. Add the remaining 1/4 cup olive oil and the vinegar. Adjust seasonings and sprinkle with cheese, to taste. The salad can be made a day or two in advance. However, the pasta will absorb the dressing. If so, add more oil and vinegar to taste. Look at how beautiful that looks. Amazing. Salads are a big hit in our house too and we eat them year round. My daughter came home with some leftover brown rice from something she ordered for lunch the other day. There wasn’t much left but I added chopped scallions and grape tomatoes, corn, and red kidney beans and mixed it with some balsamic and olive oil and she was so happy with it for lunch the next day. For such a little bit of leftover rice, it turned into a nice sized meal. I have taken to pre making salads for the week and it’s great. Everyday, I can just pull one from the fridge and pack it in my daughter’s lunch and one for me at lunchtime. At the last minute, I just roll up some roast beef and swiss and some turkey and swiss and I have a chef salad. I hope your daughter is taking notes! You’re showing her so many good habits! I love that I can cook those tenders quickly straight from the freezer. Makes dinner prep so easy.